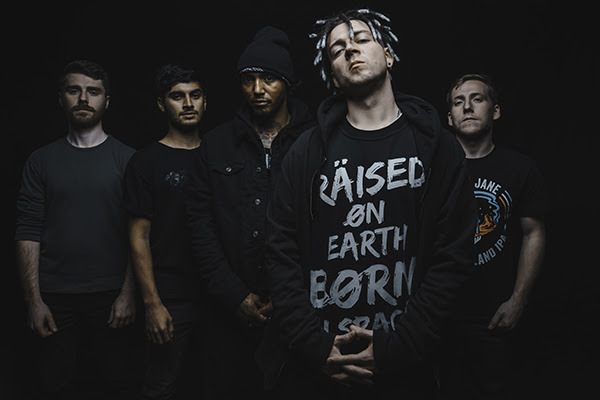 HACKTIVIST - Release Video For New Single "Reprogram", First Single To Feature New Band Line-Up! UK grime-metal quintet HACKTIVIST mark their momentous return with the video for their brand new single 'Reprogram', their first to feature their new line-up. A band that have played on Reading & Leeds and Download Festival main stages and toured alongside Korn and Enter Shikari, HACKTIVIST welcomed guitarist James Hewitt to their line­up earlier this year. Now they are fired up with a reignited passion, ready to show the world what they are truly made of. "Having taken a couple of years away from the music industry, I’d started to miss writing music and playing live.. and then comes the opportunity to join Hacktivist. Having played some shows together previously, I’d been friends with Josh and Rich for a few years ­ I think that helped things click very early on in terms of writing. We’re constantly firing ideas back and forth and have plenty of songs finished, and already playing a couple of the new ones live. They’re going down great so I can’t wait to add some more into the set!" "When I joined the Hacktivist ranks, I thought that a new front ­man was all they needed and once I filled that role we were ready to get to work creating insane conscious futurist music like never before! Though I quickly realised there was some further internal defragmentation required and the writing of new material had to be put into hyper ­sleep for a bit longer than we’d have liked. Our live shows however are always in high demand and we’ve stayed active destroying it on stages al lover the place! Finally, now that James Hewitt has enlisted as our new guitarist/producer there is a true sense of unity between the five of us and I’m beyond ecstatic that everyone will get to hear not only the ground­breaking new flavours he has brought to H, but the warp drive energy and lyricism that’s been burning in me to contribute to the future of Hacktivist ever since I came on board!!" HACKTIVIST recently released a cover of The Prodigy's 'Spitfire' as a tribute to the late Keith Flint. Check it out here. In a world where nobody knows the entire truth about why we’re here, who built the pyramids and what they were for, why we have such a destructive nature towards our planet and ourselves…A world where the only thing we know for sure is that we are living in a well­constructed downward spiral and the technologies that were supposed to make things better are of course making us worse. In a world where any attempt to find the truth or talk about these systematic anomalies got labelled as a “conspiracy theory” – finally the conspiracies are stepping out of the darkness and theories are being proven daily. As Science Fiction is becoming more and more factual and it’s getting very clear that we are on the brink of a revolution of sorts, HACKTIVIST are here to paint a silver lining around our clouded society. With not only a musical revolution of their own, continually blending genres in a way like no others, H also represents a voice that isn’t afraid of saying what needs to be said. They are already living in the future, you have the choice to either be shaped by it or to stand up with them and help shape it together. They're HACKTIVIST, they’re H, are you?